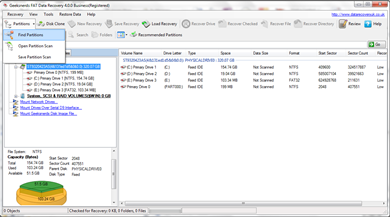 Geeksnerds FAT Recovery tool recovers data from FAT 12, FAT 16, FAT 32, VFAT and ExFAT partitions. After running the software, if you can see the partition from which you want to recover data apply scan for data recovery otherwise you should run the Partition scan to find the partition first. 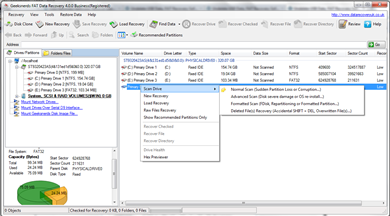 Geeksnerds FAT recovery software has two types of partition scanning algorithms: Standard and Advanced. Select the drive from which you want to recover data and then select 'Find Partition' from toolbar or 'Scan Partition' option from context menu of partition/drive. Follow the instruction given by the partition wizard to retrieve desired partition. If you are not sure about the partition or file system details, then it is recommended that you should try the “Raw File Recovery”. Select the 'Recover Drive' option from toolbar or select the files and folders that need to be recovered and then you can select the 'Recover Checked' option from toolbar or from the context menu. If you select only directories then these directories can be recovered by selecting “Recover Directory” option from toolbar or from the context menu. If you select only files then these files can be recovered by selecting “Recover File” option from toolbar or from the context menu. 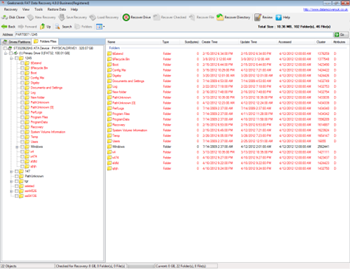 Geeksnerds FAT Data Recovery will show progress of saving the recoverable data. If you are unable to recover data by using our Geeksnerds FAT Recovery Software then you may require "In Lab Data Recovery Services". For "In Lab Data Recovery Service", call us or submit your case online.